The hunt for a new Carlsbadistan Police Chief has ended according news released by the City of Carlsbad today. Gary W. Morrison, who worked previously with the Long Beach Police Department, reportedly has 22 years of law enforcement experience. We have to agree he sounds well-qualified to represent the CPD. Me and Louie are going to follow the jump for all the details. Yesterday (April 28, 2010), Legoland California invited the media to don hard hats and go behind the scenes at the amusement park’s new $12 million Legoland Water Park. 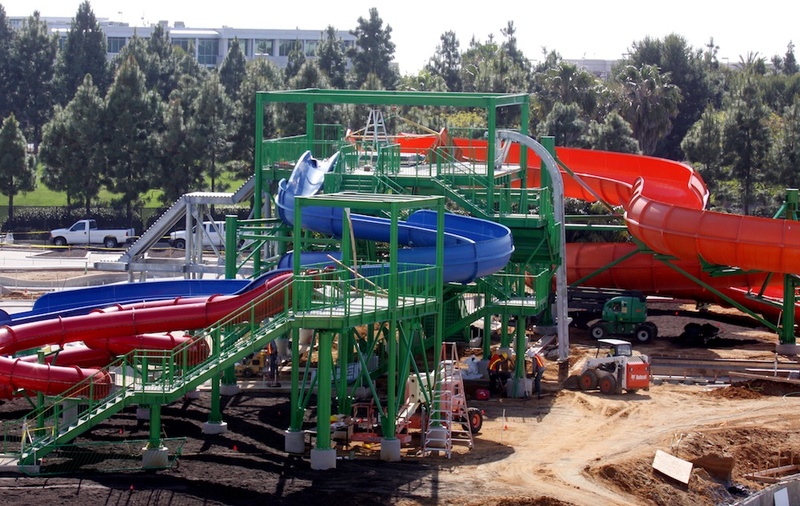 Scheduled to open on May 28, 2010, the new park will feature eight different wet rides and attractions. We may not have attended the Legoland Media Waterpark Tour, but we were very honored to be invited as media trips are the only time we can afford to get in the front gates. For more photos and the official release follow the jump. Early Sunday morning, May 2, 2010, the streets of Carlsbadistan will close and the booths will pop-up throughout the Village in preparation for the bi-annual Carlsbad Street Faire. Need a new miracle mop? A salsa making machine? A blender or miniature surfboard with your name on it? 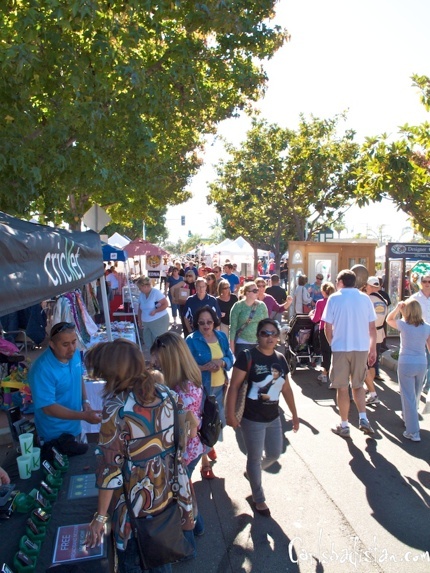 Then the Carlsbad Street Fair is the place. Arrive early, park politely, and stay all day. Just be careful in the beer garden. Click the links for Carlsbadistan coverage of past faires: November 2009, November 2008, November 2007. Wow, we’ve been around a while. Guess we’re almost three! Carlsbad’s Pacific Ridge School junior Anisha Mudaliar, 16, was one of 12 students nationwide to win a scholarship in the Young Epidemiology Scholars Competition in Washington, DC the weekend of April 23-26, 2010. Mudaliar won $15,000 for her research on youth onset diabetes. Anisha was one of 60 regional finalists from 21 states who were invited to present their projects. 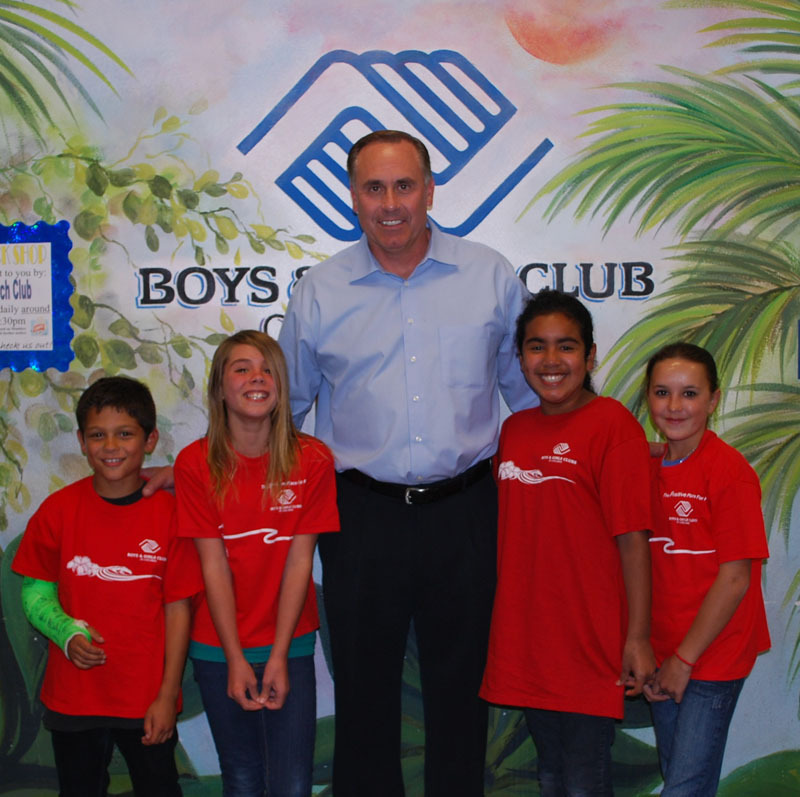 Congrats to Anisha, and to Pacific Ridge School. Last night at the Carlsbad City Council meeting Carlsbad Village Association executive director Robin Young and other Carlsbad Skatepark, Museum and Action Arts Center proponents presented their plans for the space currently occupied by the City Yard on Oak Ave. near State St. according to a Barbara Henry story in the North County Times. During Tuesday’s meeting, council members listened to the skateboarding proposal and asked questions, but did not endorse the idea. . . Councilman Mark Packard said he hoped that the group understood it would be several years before the land would be available. Project supporters said they knew this. . . “At first, we went ‘Oh, darn,’ and then we thought it gives us more time to raise the funds,” Young said. . . During her presentation, she had stressed that project supporters expect to fund their center through donations and grants. No city investment is needed, Young emphasized. It seems the City Council was not all that interested in the project currently but as City Manger Lisa Hidabrand is quoted as saying, “Now’s a good time to plan, and we’ll be happy to work with the community to plan what’s out there.” Not exactly a ringing endorsement, but we’ll take it. Former USD Men’s Basketball Coach Brad Holland has been named the new Executive Director/CPO at Boys & Girls Clubs of Carlsbad, according to a release sent out yesterday. Holland is the all-time winningest basketball coach in USD history and he even won a World Championship with the Los Angeles Lakers. That doesn’t happen without amazing leadership skills. Holland sounds like a welcome addition to the team. For all the details and the entire release, follow the jump. 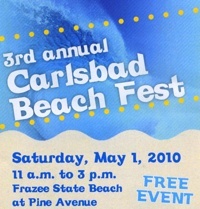 On Saturday, May 1, 2010, join the California State Parks for the Third Annual Carlsbad Beach Fest and coastal clean-up day. 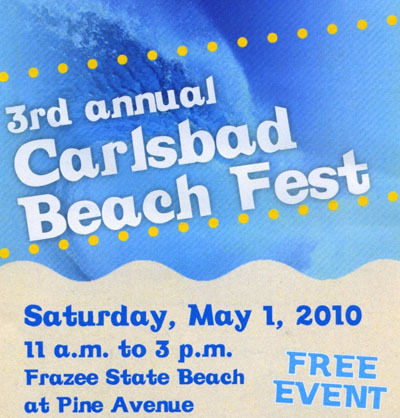 The Carlsbad Beach Fest’s main focus is to provide citizens and beach users with the opportunity to participate in a beach cleanup. To take part in the cleanup and earn a raffle ticket, please sign in at the California State Parks Welcome Station down on the sand at Tamarack/Frazee State Beach at Pine Avenue. The beach cleanup will take place from 10 a.m. to 12 p.m on Saturday, May 1st. Trash and recycling bags will be made available. Participants should bring gloves. But that’s not all. There will be live music, entertainment and at 9 AM beach volleyball legend Karch Kiraly will host a free volleyball clinic. Throw in 15 artists, a food court, and magicians and it makes an amazing day at the beach in Carlsbadistan. For more information click the link below. Raymond Firth, the former Pacific Rim Elementary School school teacher who plead guilty to “sexual battery involving two girls in his second- and third-grade classes” on March 19, 2010, was sentenced to three years and eight month in prison today (April 26, 2010) according to a story on SignOn San Diego. Firth, who had been free on bond, was taken into custody after the sentencing hearing in Vista Superior Court. . . Some of the parents of the young victims spoke at the hearing, saying they had mixed feelings about Firth’s sentence because they think there may have been more victims. 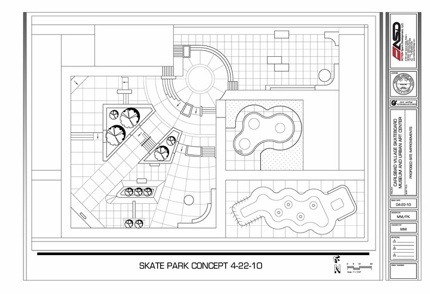 On Tuesday, April 27, 2010, proponents of the Carlsbad Skatepark, Museum and Action Arts Center will present their plans (which include the skatepark shown above) for the old City Yard on Oak Avenue near State Street to the Carlsbad City Council. The San Diego Union-Tribune outlines the group’s plans and discusses just how deeply skateboarding history runs in Carlsbad in a story titled Skateboarding legacy focus of Carlsbad plans. Since January, the Carlsbad Village Association and a group of downtown business owners have been working on plans for a Skateboarding Museum and Action Arts Center. They say it would offer a much-needed outlet for local skaters and draw tourism to the city. 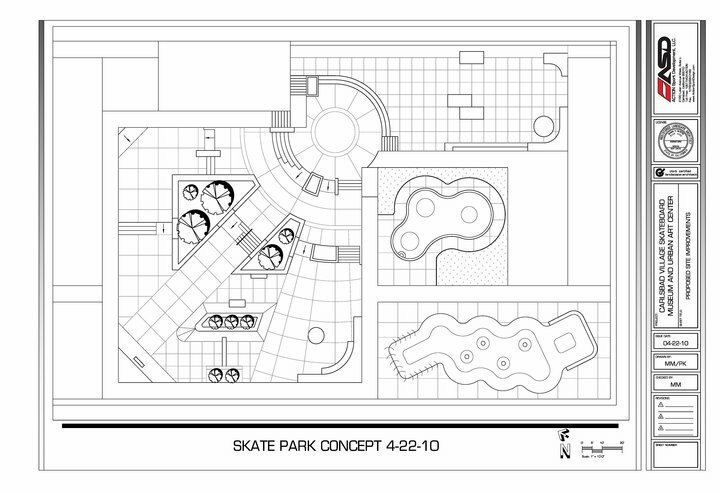 . . “The (term) ‘skate park’ was actually coined in Carlsbad,” said Robin Young, the association’s executive director. “We thought, ‘What a perfect opportunity to pay homage to that rich history.’ ” . . . The association proposes building the center on land occupied by a city maintenance yard at Oak Avenue and State Street that is slated for redevelopment. Organizers envision a skateboarding museum, a skate park and an interactive, urban arts center. Those in support of skateboarding in general and in Carlsbad specifically are encouraged to attend the City Council meeting on Tuesday evening at 6 PM. For more information click the links below and please vote in our poll in the right hand column of this page. 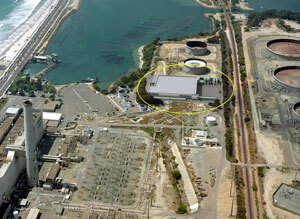 The Surfrider Foundation has definitely not thrown in the town on their opposition to the Poseidon Resources Desalination Plant scheduled to be built in the shores of Carlsbadistan’s Agua Hedionda Lagoon. According to Michael Burge story in the San Diego Union-Tribune this is one of six lawsuits that have been filed regarding Poseidon’s plans for the lagoon. Three are still progress. For the entire Surf Rider release, follow the jump or click here for Carlsbadistan’s coverage of the entire saga.